Prophet Temitope Joshua of The Synagogue, Church of All Nations, Ikotun-Egbe, Lagos, explains the source of his strength and vision, and his care for the aged and needy, to The Week team of Clement Okitikpi (MD), Oluwasegun Abifarin (Editor) and Emeka Ngwei. Mrs Joy Everbright had carried her pregnancy for 11 months. Awaiting a caesarean operation, necessary due to the wrong position of her baby in the womb, Joy had all but lost hope of delivering her child naturally. However, fearing the doctor’s scalpel and hungry for divine solution, Mrs Everbright boldly made her way to a church in Lagos where miracles were said to happen. She received more than she bargained for. 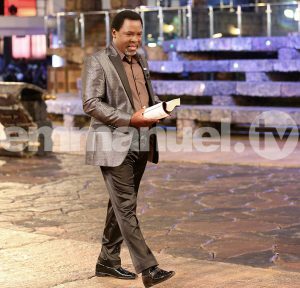 Reflections On Prophet TB Joshua At 46, written by Chiji Okafor, the celebrated artist and columnist. June 12th will ever be printed in the minds of so many Nigerians as the day that politics and democracy was beaten by rivalry, jealousy and opinion. It’s all about a man, known as M.K.O. Abiola who won the election hands down, but never spent one day as the president. The founder of the Synagogue, Church of All Nations (SCOAN), Prophet TB Joshua turns 46 on June 12th 2009.